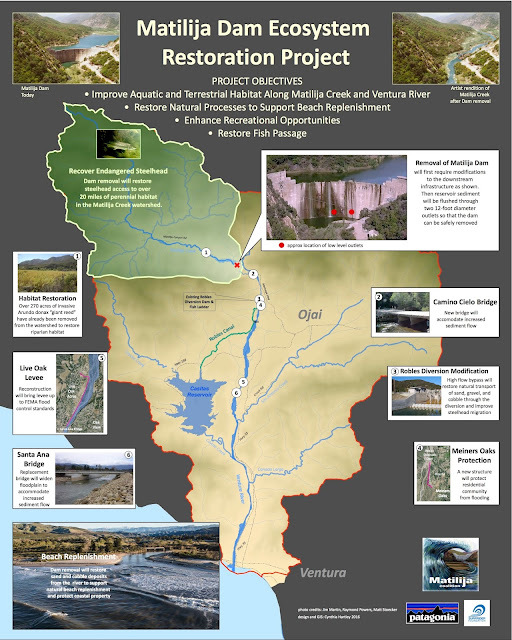 The Matilija Coalition has updated the poster describing the Matilija Dam Ecosystem Restoration project. The primary change is in the sediment management required for dam removal, which has been greatly simplified through using "natural transport" rather than expensive mechanical means to re-establish the stream bed upstream. Thanks to Cynthia Hartley for design, and photographers Raymond Powers, Jim Martin, and Matt Stoecker! "Though recognized nationally for what it accomplished, returning the beach to its natural state rather than installing artificial and ultimately ineffective barriers, the project didn't face its first real test until Dec. 11. 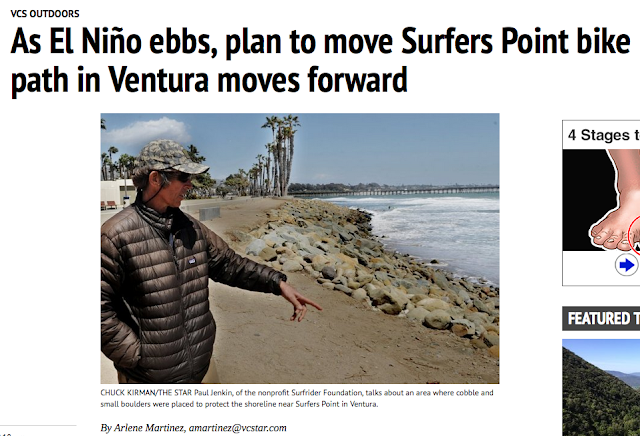 It "reacted perfectly the way it was supposed to," said Paul Jenkin of the nonprofit Surfrider Foundation, which was heavily involved in the first phase. 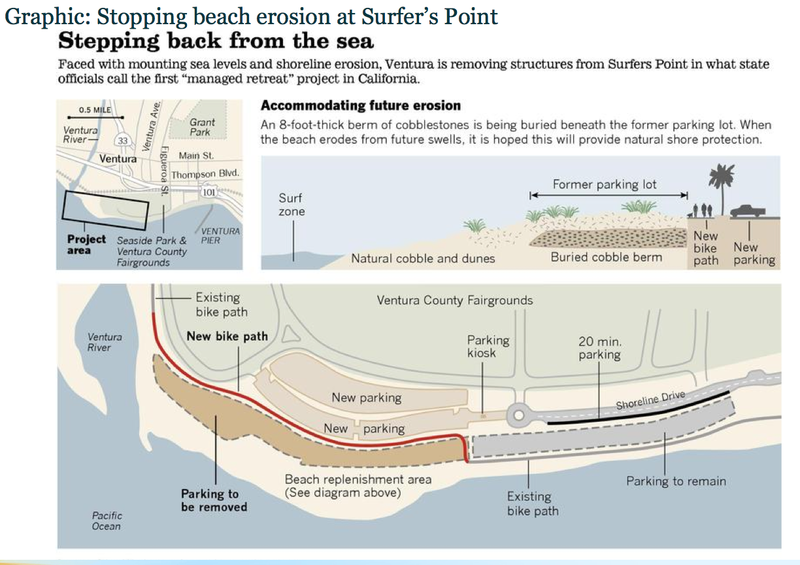 "It means that the beach adapted to the large waves." The dunes and vegetation absorbed the energy of the waves while trapping the sand. "It's a dynamic beach that comes and goes with the seasons. The ocean is able to give and take," Jenkin said. 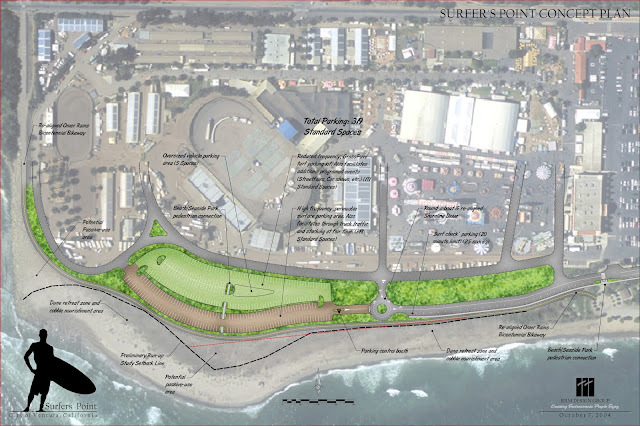 Last week, the fairgrounds board agreed to be part of a working group that includes the city, BEACON, Surfrider and others to discuss the second phase. Fairgrounds Chief Executive Director Barbara Quaid said getting everyone at the table was a good idea and allowed for discussions including "what goes into it, where's the money coming from, how does that affect the city, how does it affect the fairgrounds." It's too early to say what could happen, but Quaid said the area in the first phase did what it was supposed to do and more. "That was a tough decision to change the usage of our property," said Quaid, referring to the fairgrounds' lost parking lot. "But we knew at the time the board made the right decision. It was the right thing to do for the community."